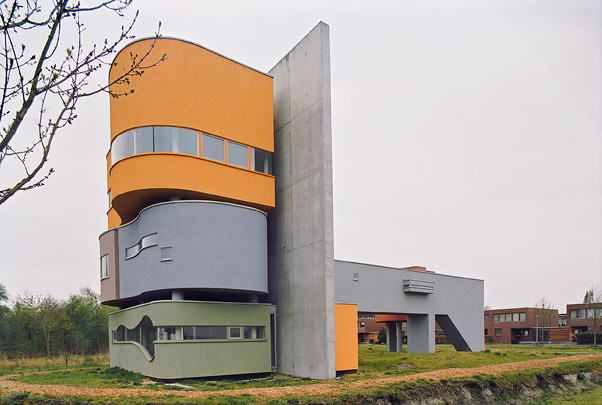 The Blue Moon paid posthumous homage to John Hejduk (1929-2000) by including in its programme the construction in Groningen of a weekend house Hejduk had designed back in 1973 for a site in Connecticut. The components flank two sides of a large concrete wall. The different household activities occupy three autonomous organic shapes hung on one side of the wall and overlooking the nearby lake. On the other side is a long covered walkway containing the entrance and a studio volume, a cylindrical stair tower and two small blocks for the bathroom and dressing room.